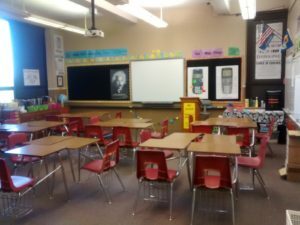 Classroom decoration is one of the most commonly neglected steps in the successful preparation for a new school year. I’ve found that teachers who really understand how to decorate and design their classrooms can use them to keep students calm, happy, and focused. Just a few hours of thoughtful planning and a small investment in materials makes the difference between a boring beige box and a colorful, calming classroom. Here are a few ideas to consider as you start to prepare for as we get ever closer to the next school year. When designing the arrangement of desks, there are two main considerations. How do you want students to interact with each other and how do you want them to interact with your lessons? 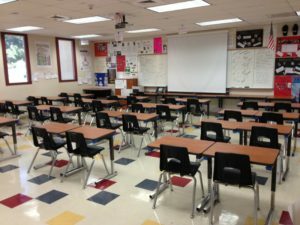 If you often do group work, it can be nice to arrange your desks into pods of four, but keep in mind that it might result in some students needing to turn their heads to see the front of the room. Maybe partner work is more up your alley. Arranging your desks in paired rows can be a nice compromise, allowing collaboration while everyone faces forward. This arrangement can also limit some of the social distraction that comes from pods of four. Lastly, where is your teacher desk? I liked to have my desk in the back of the room so that I could face forward with my students, taking more of a fellow passenger role. However, you might want to consider putting your desk on the side or the front of the room. Do what feels right. When I arrived into my empty classroom, I nearly fell asleep because of how boring it looked. I wanted my room to emit a calm vibrancy. For me, blue decoration encapsulated that mood nicely. I bought a few dozen large sheets of blue poster paper and stapled them along the top of the walls, creating a sort of 360-degree sky effect. This was particularly suitable for my classroom because it lacked a single window (that’s another story). I even recruited a couple students during the first week of school to help me cut out some white clouds. Now, students could gaze up at the clouds every time they entered my room. The best way to decorate your classroom is to let students do it for you. I started each year with a fun and colorful get-to-know-you exercise and every month or so, I made sure to assign a project that had some sort of visual art component. With over 200 students (that’s another story too), I was able to quickly curate a beautiful museum of exemplary student work. Not only does hanging student work on the walls make your classroom look better, it inspires all students to do their best. The students who are highlighted are now more motivated to turn in their best work, and the students who see their friends highlighted are motivated to put in the extra effort to get their work up on the wall. These are only a few ways that you can use the design and decoration of your classroom to make it a better learning environment. Check out all these other great ideas!